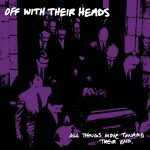 A collection of early OWTH singles and EPs and stuff. I can’t say all of these recordings are sonically the sweetest thing you’ll ever hear but the songwriting is still great and the strong melodies punch through. Some really catchy songs here. The REALLY early OWTH stuff is basically a different band; complicated indie rock with an organ and stuff. I remember the first time I played a show with them was back then and I was totally unprepared for some of those song structures, thinking I was walking into a three chord pop punk band. Taken together, this album is a cool look into how the band evolved over those first 2-3 years.